Aquarium researchers and staff are on expedition to the remote Phoenix Islands Protected Area (PIPA) to study the natural history of the islands, surrounding reefs and connecting open water ecosystems. Research on the 2015 expedition will directly inform the management and maintenance of this world-renowned MPA. Today's post comes from Aquarium veterinarian Julie Cavin. Most of the scientists on this trip are full time researchers. For me, it is a little different. As an associate veterinarian at the New England Aquarium, I am a clinician. My primary interest is in offering the best care possible for the animals in the Aquarium's collection. This is done both by my daily work, and by taking advantages of opportunities such as this. When people go to the doctor for their routine physicals or when they are not feeling well, the physician immediately knows whether any of their hematological parameters (blood values) are abnormal. This is because they have access to reference ranges for healthy people of all ages, genders and backgrounds. When a fish comes to my hospital for either a routine physical or because of an illness, there are often now reference ranges with which to compare the data that I or my colleagues collect. Some examples of these are the white blood cell count which can indicate a possible infection, red blood cell count which tells us if an animal has anemia, or potassium level which give information of health on a cellular level. Many aquariums and zoos throughout the world house elasmobranchs of various species; however, there is very little published data for healthy sharks and rays. 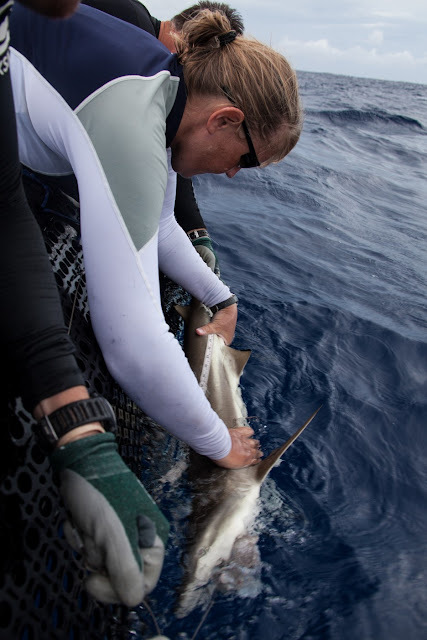 My objective on this trip is to collect blood from blacktip reef sharks and grey reef sharks that are being caught for other projects by Camrin Braun and his team from WHOI. I have been analyzing the blood from these presumed healthy animals to create reference ranges for complete blood counts (CBCs – white and red cell numbers), biochemistries (organ enzymes, electrolytes, etc), and blood gases (pH, pCO2, etc. — indicators of acute or chronic physiological stress). This will give me and my colleagues a comparison when examining either healthy or sick individuals in our care. Julie Cavin, DVM, is the Associate Veterinarian at the New England Aquarium in Boston, Massachusetts. She is responsible for the health and well being of all animals in the collection as well as rehabilitating sea turtles. She also supervises multiple veterinary externs each academic year. Prior to her current position, Dr. Cavin earned a bachelor’s degree and a Certificate in Living Marine Resource Ecology at Florida State University and a veterinary degree from North Carolina State University. She completed a two year internship at the Georgia Aquarium and a two year Fellowship at the New England Aquarium. 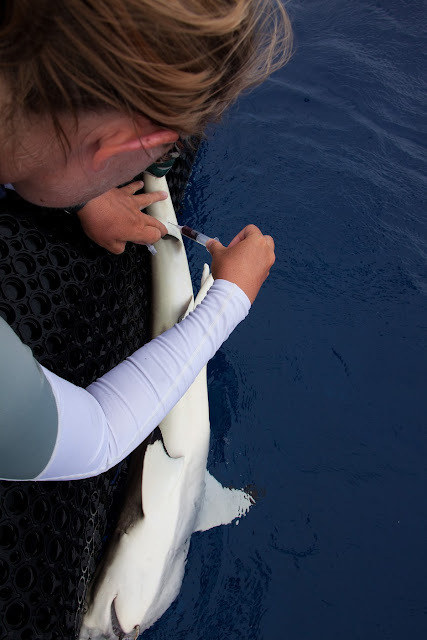 Her research interests include improved anesthetic techniques for elasmobranchs, improving nutrition for aquarium animals of all taxa and increasing the available “normal” hematologic parameters for all aquatic animals.